For "hot-off-the-press" click My Articles. "Egypt in Marseilles", KMT, Winter. "Panettone: The Story of Italy's Ubiquitous Christmas Cake", Epicurean-Traveler.com, December. "The Met's Christmas Tree and Crèche", Inside the Vatican, December. "Monsignor Iacobone:Editor and Author" , Inside the Vatican, December. "Panettone: Italy's Ubiquitous Christmas Cake" by Mother Martha, inside the Vatican, December. "Divine Beauty: From Van Gogh to Chagall and Fontana", Inside the Vatican, November. "Sora Lella": A Roman Institution", by Mother Martha, Inside the Vatican, November. "Lucky New Year's Foods", Epicurean-Traveler.com, November. "IFAD's 'Recipes for Change'", by Mother Martha, Inside the Vatican, October. "L'Espresso Guide's Top Italian Toques", Epicurean-Traveler.com, October. "Gondoliers Unite to Protect their 'Venetianess'", Epicurean-Traveler.com, October. "A Manhattan Jack Dell è Proprietario di 'Katz's', Delifood Ebraico", La Madia Travelfood, settembre. "The Vatican's Brand New Tourist Attraction", Epicurean-Traveler.com, September. "SOS for Italy's Cheese", Epicurean-Traveler.com, September. "IFAD's 'Recipes for Change'", Epicurean-Traveler.com, September. "Scientific Mummy Studies at the Vatican", KMT, Fall. "Rome's Best Gelaterie", by Mother Martha, Inside the Vatican, August/September. "Additional Restaurants In or Near Monuments: Part One", by Mother Martha, Inside the Vatican, June/July. "Twenty Tapestries Tell the Biblical Story of Joseph", inside the Vatican, June/July. "Rome's Best Gelaterie", Epicurean-Traveler.com, June. "Jack Dell: The Owner of Katz's, New York City's Oldest and Best Deli", Epicurean-Traveler.com, May. "Msgr. Iacobone: Holy See's Special Delegate for 'Expo'", Inside the Vatican, May. Gran Meliá Rome: A Luxury Resort in the Heart of the City", by Mother Martha, Inside the Vatican, May. "The Janiculum: Rome's Eighth Hill", Epicurean Traveler.com, April. "Lorenzo Lotto and Loreto's Artistic Treasures", Inside the Vatican, April. "''The Egg's Hard Shell Signified The Sealed Door of the Tomb': Easter Eggs and Other Easter Traditions", by Mother Martha, Inside the Vatican, April. The Vatican Mummy Project and its Discoveries", Inside the Vatican, March. "Pope Francis Becomes a Sommelier; So Can You", by Mother Martha, Inside the Vatican, March. "New Light on Egyptology in Milan: From Brera to the Pyramids", KMT, Spring. "The Rediscovery of Photographer Theodor Kofler", KMT, Spring. "New 'Tower' Built at North American College", Inside the Vatican, February. "Want a Cheap Room Near The Vatican? Try Via Monte del Gallo", by Mother Martha, Inside the Vatican, February. "Update on Papal Gastronomy", Epicurean-Traveler.com, February. 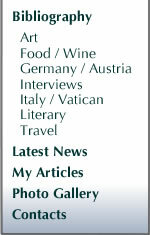 "January 21: Wine News from Vatican City and Rome", Epicurean-Traveler.com, February. "Saint Francis Visits New York", Inside the Vatican, January. "The Pizza Connection", by Mother Martha, Inside the Vatican, January. "The Pierpont Morgan Library's Crusader's Bible", Inside the Vatican, December. "Trattoria De Gli Amici: Rome's Restaurant with a Mission", by Mother Martha, Inside the Vatican, December. "Traveling to Tuscany? ", Epicurean-Travler.com, December 9th. "Rome's First Tribute to Hans Memling", Inside the Vatican, November. "Hostaria Nerone: A Family-Run Oasis Above the Colosseum", by Mother Martha, Inside the Vatican, November. "Papal Gastronomy since St. Peter", Epicurean-Traveler.com, November. "Heinz Beck: Rome's Only Chef with Three Michelin Stars", by Mother Martha, Inside the Vatican, October. "Sacred Splendor: Treasures of Palazzo Pitti's 'Chapel of the Relics'", Inside the Vatican, October. "Papal Gastronomy Since St. Peter", Inside the Vatican, October. "How the Counter-Reformation Popes Brought New Hope", Inside the Vatican, August/September. "Hotel Capo D'Africa: Between the Colosseum and St. John in Lateran", by Mother Martha, Inside the Vatican, August/September. "1714: Two Interviews at Strasbourg' s Top Restaurant", Epicurean-Traveler.com, July. "How God's word Spread Geographically", Inside the Vatican, June/July. "Palazzo Cardinal Cesi: In the Heart of Christendom"by Mother Martha , Inside the Vatican, June/July. "Niko Romito: La cucina etica dell'unico chef a sud di Roma con tre stelle Michelin", La Madia Travelfood", luglio. "Gianluca Biscalchin: Il primo illustratore, giornalista enogastronomico d'Italia nonché aspirante chef, La Madia Travelfood, maggio. "Residenza Paolo VI: At the Very Heart of Christendom", by Mother Martha, Inside the Vatican, May. "The Vatican Apostolic Library Going Ever More Public", Inside the Vatican, May. "Hotel Michelangelo", by Mother Martha, Inside the Vatican, April. "Pope John XXIII: Reflections 50 Years Later", Inside the Vatican, April. "Once in a Lifetime: A Unique Experience", Inside the Vatican, April. "'Il Cantico': A welcoming Oasis in Rome" by Mother Martha, Inside the Vatican, March. "Intervista a Cédric Moulot e Thierry Schwartz", La Madia Travelfood, marzo/aprile. "Bagna Cauda: Pope Francis' Favorite Dish" by Mother Martha, Inside the Vatican, February. "Antoniazzo Romano: The Leading Rome-Born Renaissance Painter", Inside the Vatican, January. "'La Vittoria' by Mother Martha", inside the Vatican, January. "Gert de Mangeleer: Il più giovane chef belga con tre stelle Michelin, La Madia Travelfood, gennaio/febbraio. "Cleopatra Returns to Rome", KMT, December. "Daniel Humm: Lo chef più amato a New York", La Madia Travelfood, novembre. "Annie Féolde: The first woman Chef in Italy with 3 Michelin Stars", Epicurean-Traveler.com, October. "Tyndaris: 'The City of Mary'", Inside the Vatican, October. "Illuminating Faith: The Eucharist in Medieval Life and Art", Inside the Vatican, August/September. "Celebrating the 500th Anniversary of Pope Leo X's Election", Inside the Vatican, August/September. "The Birth of Italian Renaissance Art", Inside the Vatican, June/July. "Titian: A Long-Awaited Retrospective Not to Be Missed", Inside the Vatican, May. "St. Peter's Journey: The Meaning of Faith", Inside the Vatican, April. "South of the Border--Geology, Garnets, and Glass", German Life, April/May. "Richard Fuchs and Marek Fichtner: Promising in Prague", Epicurean-Traveler.com, March. "The Edict of Milan's 1700th Anniversary", Inside the Vatican, March. "Egypt in Antwerp at the 'Museum on the River'", KMT , Spring. "Marino Marini: Il renaissance man della cucina italiana", La Madia Travelfood", marzo. "Prague's Church of Our Lady Victorious", Inside the Vatican, February. "Borek Sipek: A Self-made Renaissance Man", Epicurean-Traveler.com, February. "Michele Lirosi: Co-fondatore e -proprietario del primo agriturismo didattico della Sicilia", La Madia Travelfood, gennaio/febbraio. "Marino Marini: The Renaissance Man of Italian Cuisine", Epicurean-Traveler.com, January. "Sacred Places in and Around Prague's Castle", Inside the Vatican, January. "Michele Lirosi: Co-founder and Owner of Sicily's First Agriturismo", Epicurean-Traveler.com, December. "His Eminence Dominik Cardinal Duka of the Czech Republic", Inside the Vatican, December. "Bernini: The Popes' Artist in Baroque Rome", Inside the Vatican, November. "Turin's Museo Egizio on Transition", KMT, Winter 2012-13. "Roman Paulus e Oldrich Sahajdak: I primi chef cechi a Praga entrambi con una stella Michelin," La Madia Travelfood, dicembre. "Roman Paulus and Oldrich Sahajdak: Prague's First Chefs Each With a Michelin Star", Epicurean-Traveler.com, November. "Geert Van Hecke: Il primo chef fiammingo con 3 stelle Michelin", La Madia Travelfood, novembre. "André-Joseph Léonard: Archbishop of Mechelen-Brussels and Primate of Belgium", Inside the Vatican, October. "Egypt in Brussels", KMT, Fall. "Geert Van Hecke: The First Flemish Chef Awarded Three Michelin Stars", Epicurean-Traveler.com, August. "Quilling: Devotional Creations from Cloistered Orders", Inside the Vatican, August/September. "The Best in Basel: A Paradise for Museum Buffs", Epicurean-Traveler.com, June. "The Egyptology Archives of the University of Milan, KMT, Summer. "Tony May: il pioneer della cucina authentic italians negli USA", La Madia Travelfood, maggio/giugno. "Jacopo Comin: The last Great Painter of the Italian Renaissance", Inside the Vatican, May. "One Potato, Two Potato, Three Potato, Four, No--Over 4,000", Epicurean-Traveler.com, April. "'Lux in Arcana': The Vatican Secret Archive", inside the Vatican, April. "How Leonardo Da Vinci Pictured the Last Supper", inside the Vatican, March. "Guercino: An Artistic Genius Much Esteemed in His Lifetime", Inside the Vatican, February. "The Venetian Island of St. Lazarus: Where Armenian Culture Survived the Diaspora", Inside the Vatican, February. "The Best in Basel: A Paradise for Museum Buffs", German Life, February/March. "Tantris: il tempip gastronomico di Monaco (Bavaria), La Madia Travelfood, gennaio/febbraio. "Rome at the Time of Caravaggio", Inside the Vatican, January. "Armenia: Imprints of a Civilization", Inside the Vatican, January. "Ancient Egypt in Avignon France", KMT, Winter 2011/12. "Joseph Zwilling: Director of communications Office, Archdiocese of New York", Inside the Vatican, December. "Filippino Lippi and Botticelli in Fifteenth-Century Florence", Inside "the Vatican, December. "Celebrating Renaissance Art and Artists", Inside the Vatican, November. "Tanja Grandits: Eccellenza Professionale in Svizzera", La Madia Travelfood, novembre. "Tony May: The Pioneer of Authentic Italian Cuisine in the USA", Epicurean-Traveler.com, October. "The Benediktweg and Altoetting, the "Bavarian National Shrine", Inside the Vatican, October. "The Fascination with Egypt, an Exhibition in Orvieto, Italy", KMT, Fall 2011. "Vatican City's 100 Fountains", Inside the Vatican, August/September. "Monsignor Paul Tighe: Secretary to the Pontifical Commission for Social Communications", Inside the Vatican, August/September. "I Piatti dell'estate di Don Alfonso", La Madia Travelfood, luglio/agosto. "The Treasure of San Gennaro: 700 Years of Art and Devotion", Inside the Vatican, June/July. "Tatsuya Iwasaki: il migliore pasticciere in Italia e giapponese", La Madia Travelfood, giugno. "Egypt in Mantua, Italy", KMT, Summer 2011. "Fra Giovanni Rossi: Head Chaplain at Rome's Gemelli Hospital", Inside the Vatican, May. "Tanja Grandits: Swiss chef of the Year", Epicurean-Traveler.com, May. "The Holy See's Newest Museum", Inside the Vatican, April. "Tatsuya Iwasaki: Twice Italy's Best Pastry Chef is from Japan", Epicurean-Traveler.com, March. "Egypt on the Upper Rhine in Basel, Switzerland", KMT, Spring 2011. "Peter Knogl: Swiss Chef of the Yeart 2011", Epicurean-Traveler.com, February. "Father Mark Haydu: International Coordinator of the Patrons of the Vatican Museums", Inside the Vatican, February. "Nick Anderer: New York's Top 'Roman' Chef, Epicurean-Traveler.com, January. "Egypt on Lake Michigan at Chicago's Field Museum of Natural History", KMT, Winter 2010-11. "Alfons Schuhbeck: Celebrity Chef, Restaurateur, Author, and Businessman",Epicurean-Traveler, November. "Giancarlo Zigante: il re dei tartufi istriani", La Madia Travelfood, ottobre. "Raphael's Sistine Chapel Tapestries Visit London", Inside the Vatican, August/September. "Scarello: Il Rinnovamento nel Friuli/Venezia Giulia, La Madia Travelfood, luglio/agosto. "Red Star Line Immigration Museum", www.newimmigration.eu, July. "Patron Saints of Immigration", www.newimmigration.eu, July. "Treasures of Heaven: Saints, Relics, and Devotion in Medieval Europe",Inside the Vatican, June/July. "Egypt in Zagreb", KMT, Summer. "Welcome to the New World", www.newimmigration.eu, May. "Memory and Hope: To Restore L'Aquila's Religious Patrimony", Inside the Vatican, May. "TASTE: A Grand Tour of Italy's Best Foods and Wines", Epicurean-Traveler.com, May. "Il Caso letterario di Elena Kostioukovitch e del suo libro su l'Italia che ama parlare del cibo", La Madia Travelfood", maggio. "Emanuele Scarello: President of Italy's "Jeunes Restaurateurs d'Europe", Epicurean-Traveler.com, April. "The Genius of Caravaggio: The Father of Modern Painting", Inside the Vatican, April. "Luxembourg--Ten Reasons to Visit the 'Green Heart of Europe'", German Life, April/May. "Elena Kostioukovitch: Professor, Literary Agent, Translator and Author", Epicurean-Traveler.com, March. "On at New York's Morgan Library and Museum", Inside the Vatican, March.
" Egypt in Bolton, U.K.", KMT, Spring. "Monsignor Robert T. Ritchie: Rector of St. Patrick's Cathedral, New York City", " Inside the Vatican, February. "Lea Linster: L'unica donna vincitrice del 'Bocuse D'Or'", La MadiaTravelfood, gennaio/febbraio. "Gennaro Esposito: The Best Chef of Italy's Campania Region", Epicurean-Traveler.com, January. "Ancient Egypt in Manchester, U.K.", KMT, Winter. "Michelangelo: The 'Plastic Surgeon' of Rome's Ancient Architecture", Inside the Vatican, November. "Ancient Egypt on the Tagus", KMT, Fall. "Ilario Mosconi: The Only Italian Chef Outside Italian with Two Michelin Stars, Epicurean-Traveler.com, October. "St. Lazarus Island: the Venetian Custodian of Armenian Culture", Yerevan, Fall. "Sylvie Bisdorff: Champion of Luxembourg's Cuisine", Epicurean-Traveler.com, August. "Inside (and Just Outside) of Vatican City", Inside the Vatican, June/July. "Hype About Tripe", Epicurean-Traveler.com, June. "Melk Abbey: A Microcosm of Austrian History", German Life, June/July. "Marzapane: da Toledo ed altrove", La Madia Travelfood, giugno. "Giotto: The Earliest "Renaissance" Artist", Inside the Vatican, May. "Vitor Sobral", La Madia Travelfood, maggio. "St. George: Defender of the Faith--and Promoter of Books", Inside the Vatican, April. "Marzipan/Mazapan: From Toledo and Beyond", Epicurean-Traveler.com, April 3. "Vincenzo Conticello: pizza si, "pizzo' no", La Madia Travefood, marzo. "Byzantium 330-1453: Eleven Centuries of Christian Art", Inside the Vatican, February. "Restauranteur Vincenzo Conticello: No more 'Pizzo' in Palermo", Epicurean-Traveler.com, February 26. "Bellini: The Father of Venetian Painting", Inside the Vatican, December. "Vitor Sobral: Mr. Potuguese Cuisine At Home and Abroad", Epicurean-Traveler,.com, December 10. "Ancient Egyptian Art in Lisbon's Calouste Gulbenkian Museum", KMT, Winter 2008-08. "Egypt on the Tiber", KMT, Fall 2008. "Jewish Rome: Europe's Oldest Community", Epicurean-Traveler.com, September 8. "Vercelli: Off the Beaten Track in Piedmont", Epicurean-Traveler.com, August 7. "Vercelli: Of Rice, Old Books, and Varallo's Sacred Mountain", Inside the Vatican, August/September. "Rome in the Fifeenth Century" Inside the Vatican, June/July. "Ornatissimo Codice: Montefeltro's Library Goes Home Again", Inside the Vatican, June/July. "Donald W. Wuerl: Archbishop of Washington, D.C., Inside the Vatican, May. "The Holy See and America", Inside the Vatican, May..
"Tom Keller: Il mgliore chef degli Stati Uniti", La Madia Travelfood, April. "Venice: Europe's First Publishing Capital", Inside the Vatican, December. "The Egyptian Collection of Bologna, Italy", KMT, Winter, 2007-08. "An Interview with Dun Gifford, President of Oldways, the Food Issues Think Tank", Epicurean-Traveler.com, November 6. "Tom Keller: America's Super Chef," Epicurean-Traveler.com, November 5. "Federico da Montefeltro and his Library", Inside the Vatican, August/September. "Egypt in Milan", KMT, Autumn. "China Gives Thumbs-Up to San Daniele", Epicurean-Traveler.com, June 22. "Venice and the Islamic World", Inside the Vatican, June/July. "Nefer: The Woman in Ancient Egypt", KMT, Summer. "Pizza Connection", Epicurean-Traveler.com, May 1. "Las Hueglas Apocalyse", Inside the Vatican, May. "In Search of Beauty: Duerer in Italy", Inside the Vatican, May. "Celebrating St. Nicholas: Universally Beloved", Inside the Vatican, April. "Inside (and Just Outside) The Vatican: Practical Hints", Epicurean-Traveler.com, Easter Sunday. "Celebrating the Tomato and Toscanini", Epicurean-Traveler.com, April 1. Elisabeth Guertler: Vienna's Top Hotel", Epicurean-Traveler.com, March 29. '"Habemus Papam': Pontifical Elections from St. Peter to Benedict XVI, Interview with Ambrogio M. Piazzoni", Inside the Vatican, March. "Pietro Leemann: Italy's Only Vegetarian Chef Starred in Michelin", Epicurean-Traveler.com, March 7. "Cesare Casella: Un ponte tra la Toscana e New York", La Madia Travelfood, March. "Seeing St. Francis: The Moorman Collection", Inside the Vatican, February. "Ancient Egypt in the Midlands of the U.K: The Collection of the Biirmingham Museum. ", KMT, Spring. "Roberto E. Wirth: Born a Hotelier", Epicurean-Traveler.com, February 5. "Italian Culinary Academy Opens in Manhattan", Epicurean-Traveler.com, January 8. "Jesus Colina", Inside the Vatican, January. "Petros Eni: An artistic Celebration of St. Peter's Basilica", Inside the Vatican, December. "Cesare Casella: A Bridge Between Tuscany and New York", Epicurean Traveler, December 4, 2006. "Egypt on Merseyside", KMT, Winter 2006-2007. "Lorenzo Villoresi: World-Champion Nose", Epicurean Traveler, November 27. "Prague's Strahov Monastery and Library: Eastern Europe's Oldest Cultural Center", Inside the Vatican, November. "Festive Vienna", German Life, December 2006/January 2007. "Guangzhou: la capitale gastronomica della Cina", La Madia Travelfood, November. "Prosciutto with a Capital P", Epicurean Traveler, October 3, 2006. "Guangzhou: China's Capital of Gastronomy", Epicurean Traveler, September 19. "Der Petersdom: Seit 500 Jahren ein Einzigartiges Meisterwerk der Kunst und des Glaubens", Inside the Vatican, July/August. "Constantine the Great: York's Roman Emperor", Inside the Vatican, August/September. "Traces of Egypt at Hadrian's Villa, Tivoli", KMT, Fall 2006. "St. Peter's Basilica: For 500 Years a Unique Masterpiece of Art and Faith", Inside the Vatican, June/July. "Vorwarts, Christiche Soldaten", Inside the Vatican (German edition), June. "Antonello da Messina: Einer, der Spuren hinterliess" , Inside the Vatican (German edition), June. "Intervista a Marc Vetri: Lo Chef/Proprietario del ristorante italiano numero uno del Nord America", La Madia Travelfood, June 2006. "Egypt on the Danube", KMT, Summer 2006. "Onward Christian Soldiers", Inside the Vatican, May 2006. "Eyeglasses--Made to Magnify God's Word", Inside the Vatican, April 2006. "An inside look at the Vatican's Swiss Guard", Catholic Digest, March 2006. "The World's Greatest Museums? ", Inside the Vatican, March 2006. "Buon compleanno Dresda", La Madia Travelfood, March 2006. "Ancient Egyptian and Egyptianized Roman Art in Vatican City", KMT, Spring 2006. "German Chocolate--Cologne's Imhoff-Stollwerck Chocolate Museum", German Life, February/March 2006. "St. Deiniol's Library: The place to book into", Inside the Vatican, February 2006. "Celebrating Sacred Art Throughout the USA", Inside the Vatican, January 2006. "Egypt on the Adriatic", KMT, Winter 2005-06. "Tuscan Art Comes Home", Inside the Vatican, December 2005. "Arnolfo Who? ", Inside the Vatican, November 2005. "Windows into Paradise", Inside the Vatican, October 2005. "The Homes of a Great Dane", Around the World Radio.com, October 5, 2005. "Consulates Can Help", Around the World Radio.com, October 5, 2005. "Naples: The Pizza Connection", Around the World Radio.com, October 5, 2005. "Walter Filiputti: Mr. Eno-gastronomia del Friuli/Venezia- Giulia", La Madia Travelfood, October 2005. "Aufwiedersehen Writer's Block", Around the World Radio.com, August 11, 2005. "Pope Benedict XVI's Travels", Around the World Radio.com, August 11, 2005. "And the Word Became...Print", Inside the Vatican, August/September 2005. "Passion Play in Italy's Piemonte", Around the World Radio.com, July 26, 2005. "Preserving the Past: Interview with Father Raffaele Farina", Inside the Vatican, July 2005. "He Raised 100 Children from the Dead: Saint Nicholas of Tolentino", Inside the Vatican, July 2005. "The Swiss Guard Turns 500", Inside the Vatican, June 2005. "Florence from the Arno", Around the World Radio.com, April 25, 2005. "Andrea Accordi, un'anima innovativa a Firenze", La Madia Travelfood, April 2005. "Natalia Tsarkova: There's a Light inside of the Holy Father", Inside the Vatican, April 2005. "Inside the Vatican", Around the World Radio.com, March 19, 2005. "Just Outside the Vatican", Around the World Radio.com, March 19, 2005. "Monte Amiata: A Mountain for every Taste", Around the World Radio.com, March 19, 2005. "The Last Duccio", Inside the Vatican, March 2005. "Nina Zagat: la musa delle guide gastronomiche americane", La Madia Travelfood, March 2005. "Venice's Gondolas: Vessels of Romance", Renaissance, Issue 41, February 2005. "#9: The Artist; Natalia Tsarkova", Inside the Vatican, January/February 2005. "Pedrini and the Chinese Rites Controversy", Inside the Vatican, January/February 2005. "Hype About Tripe", Around the World Radio.com, January 17, 2005. "Montereggio: Where Booksellers Couldn't Read", Bookdealer, December 23, 2004. "Fra Carnevale: A Rediscovered Maestro ", Inside the Vatican, December 2004. "Forty-three Popes in 500 Years of Art", Inside the Vatican, December 2004. "The Most Hospitable Library", Around the World Radio.com, December 8, 2004. "Suzanne Ferrell Nicholson: It's Better to Paint in the Morning", Inside the Vatican, November 2004. "Egypt and Egyptology in Cremona", " KMT, Winter 2004-05. "Eating among the Ruins in Rome", Around the World Radio.com, November 17, 2004. "Books and Roses in Barcelona", Around the World Radio.com, November 17, 2004. "London's Most Sinister Shop", Around the World Radio.com, November 17, 2004. "Munching in Madrid", Around the World Radio.com, November 17, 2004. "An Exiled Claimant to the English Throne", Inside the Vatican, October 2004. "Ancient Egypt in Philadelphia", KMT, Fall 2004. "Andrea Zanfi's Wine Journeys", Epicurean Traveler, July 2004. "An Enterprising Italian Sole: Polegato's 10 Steps to Success and Climbing", Epicurean Traveler, July 2004. "Polegato's 'La Gioiosa' and Villa Sandi", Epicurean Traveler, July 2004. "Egypt on the Arno", KMT, Summer 2004. "Many Happy Returns, Petrarch", Inside the Vatican, June-July 2004. "Poet Petrarch to Receive a Facelift for his 700th Birthday", Renaissance, Issue 37, June 2004. "Descendants of New York's Book Row", Bookdealer, June 24, 2004. "World Confectionery Championship", Epicurean Traveler, June 2004. "Petrarch's Face Lift: Postcard from Padua", Poets & Writers, May 11, 2004. "Intervista a Bruno Gambacorta, il conduttore di "Eat Parade", La Madia Travelfood, May 2004. "Bloomsday: Another Reason to ReJoyce", Poets & Writers, May/June 2004. "An Edible Work-of-Art: Parmesan", Epicurean Traveler, April 2004. "Mount Amiata: A Mountain for Every Taste", Epicurean Traveler, April 2004. "ReJoyce! Celebrating Bloomsday 100", Bookdealer, April 8, 2004. "Italy Celebrates Perugino", Renaissance, Issue 36, April 2004. "A Rose for Love and a Book Forever: Postcard from Barcelona", Poets & Writers, April 6, 2004. "Turin's Museo Egizio: Ancient Egypt on the River Po", KMT, Spring 2004. "Amiata: Tuscany's Delectable Mountain", Virtual Gourmet, March 29, 2004. "Many Happy Returns Petrarch! ", Bookdealer, February 12, 2004. "Parmigiano-Reggiano-A Museum of its Own", Virtual Gourmet, February 9, 2004. "Don Alfonso 1890: Una storia che sa di favola", Epicurean Traveler, February 2004. "The Gondola: A Timeless Classic", Horus, January/March 2004. "Sant Jordi: Books and Roses in Barcelona", Epicurean Traveler, January 2004. "San Lazzaro: A Bastion of Armenian Culture in Exile", Epicurean Traveler, January 2004. "Keeping The Past Aflame: A Profile of Shirley Hazzard", Poets & Writers, January/February 2004. "Le Città della Pizza", La Madia Travelfood, December 2003. "Make Love, Not War: An Interview with Shirley Hazzard", Bookdealer, November 27, 2003. "Gualtiero Marchesi: Ambassador non plus ultra of Italian Cuisine," Epicurean Traveler, November/December 2003. "Shakespeare in Art Featured in London Gallery", Renaissance, Issue 33, October 2003. "Rome's First Bloomsday at Caffé Greco", Bookdealer, September 18, 2003. "Dublin's Chester Beatty Library", Renaissance, Issue 32, August 2003. "Venice: Europe's first Publishing Capital", Bookdealer, July 24, 2003. "Library Hotels", Epicurean Traveler, July/August 2003. "All Roads Lead to Rome: Roman Cooking Schools and Wine Academy", Epicurean Traveler, July/August, 2003. "Anything Left-Handed", Epicurean Traveler, July/August, 2003. "Three Places to Book Into", Bookdealer, June 26th, 2003. "Anything Left-Handed: Where Left is Always Right", Bookdealer, May 29, 2003. "Pizza Cult" Food & Beverage International, May 2003. "Shakespeare in Art", Bookdealer, May 15, 2003. "Sant Jordi Day: Books and Roses in Barcelona", Bookdealer, April 17, 2003. "Shakespeare in Art", Travel World International, March/April 2003. "Dublin's Multicultural Library: Chester Beatty's Gift to Ireland", Bookdealer, March 20, 2003. "Com'è una PIZZA DI SUCCESSO", La Madia Travelfood, March 2003. "Vercelli: Of Rice and Old Books", Bookdealer, March 6, 2003. "Gianfranco Vissani: Italy's Outspoken Bocuse", Epicurean Traveler, February 2003. "The Latest on Pizza: Italy's Best Pizza", Epicurean Traveler, February 2003. "On Byron and Biography: An Interview with Fiona MacCarthy", Bookdealer, February 20, 2003. "The Cult of Byron", Bookdealer, February 6, 2003. "Dublin's Multi-Cultural Treasure-Trove", Travel World International, January/February 2003. "Rome's Protestant Cemetery: Keats and Shelley's final home", Bookdealer, January 23, 2003. "Rome's Keats/Shelley Memorial Turns 100", Bookdealer, January 2, 2003. "Eating Among the Ruins", SilverKris, January 2003. "The Pharaohs", Horus, January/March 2003. "'The Pharaohs' Reign at Venice's Palazzo Grassi", KMT, January/March 2003. "A Touch of Egypt on the Tiber", Horus, October/December 2002. "I, Apicius", Europe, October 2002. "Venice: Eating in the Magic Kingdom", Epicurean Traveler, June 2002. "A touch of egypt on the tiber, Travel World International, May/June 2002. "Gladstone's Getaway", Europe, May 2002. "Books and Roses in Barcelona", Europe, April 2002. "The Art of Combat", Art & Antiques, February 2002. "Louise McDermott's Italica Books", Antiquarian Book Monthly, October 2001. "Casa Guidi--The Home of Elizabeth and Robert Browning", Literary Traveler, October 2001. "Gladiator, The Prequel", Qantas: The Australian Way, August 2001. "When Falls the Colosseum", Travel World International, July/August 2001. "Claudio de Polo Saibanti", Antiquarian Book Monthly, July 2001. "at 150 ever-modern Fratelli Alinari goes online", Antiquarian Book Monthly, June 2001. "La Secunda Renaixença: Catalonia Reborn", Epicurean, May/June 2001. "D'Annunzio: man, hero, poet", Antiquarian Book Monthly, May 2001. "A Taste of New Orleans", Epicurean, March/April 2001. "Un Turco italiano", Film Cronache, Marzo/aprile 2001. "A Harvest of Information", Antiquarian Book Monthly, March 2001. "William Blake: The Exhibition", Antiquarian Book Monthly, January 2001. "Imagining the Ideal: Utopia and the Rest of all Possible Worlds", Antiquarian Book Monthly, December 2000. "Looking glass", Qantas: The Australian Way, November 2000. "Island Life", Qantas: The Australian Way, October 2000. "Codex B: The Gospels of the Peoples, Antiquarian Book Monthly, October 2000. "Museu Egipi: Barcelona's Newest", Bahrain Gateway, September/October 2000. "Barcelona Reborn", Qantas: The Australian Way, September 2000. "Obelisks Migrated", Silver Kris, August 2000. "Dining Amidst the Ruins of Rome", Epicurean, August/September 2000. "The Marciana National Library: 'Brainchild of Petrarch'", Antiquarian Book Monthly, July 2000. "The New York Academy of Medicine, founded to improve Public Health", Antiquarian Book Monthly, July 2000. "Roving Gourmet: Venice", Hemispheres, April 2000. "A Rose for Love and a Book Forever", Antiquarian Book Monthly, April 2000. "The Berg Collection to turn sixty", Antiquarian Book Monthly, February 2000. "Taxi Tactics in Athens", Golden Falcon, January 2000. "The Magic of Venice", Oryx, November-December 1999. "The Treasure of St. Francis of Assisi", Inside the Vatican, August-September 1999. "Roving Gourmet: Amid Rome's Ruins", Hemispheres, July 1999. "Rome and Armenia: Art for a 1,700 Year Anniversary", Inside the Vatican, June-July 1999. "U.S. consulates help Americans abroad--but not always", The Denver Post, June 27, 1999. "Rome and Armenia: Testimony of a Tempestuous Love", Antiquarian Book Monthly, June 1999. "The Treasury of Saint Francis of Assisi on World Tour", Antiquarian Book Monthly, May 1999. "Danish Tales", Silver Kris, March 1999. "Eating Among the Ruins", La cucina italiana, March/April 1999. "New Orleans: America's Most Fun-Loving City", Golden Falcon, February 1999. "Love Story", Period Living & Traditional Homes, February 1999. "Scenes from a City", The Australian Way, February 1999. "Assisting Assisi", The Australian Way, February 1999. "The best of a lost age", The Australian Way, January 1999. "Art at all hours", The Australian Way, December 1998. "Venice in Winter", New York Daily News, November 15, 1998. "Feasting on History", The Australian Way, November 1998. "The Houses Where Keats Lived", The Antiquarian Book Monthly, October 1998. "A Villa Somewhere", there, Autumn 1998. "London for Lefties", The Australian Way, August 1998. "When in Rome, Eat Gelato", Bahrain Gateway, July/August 1998. "Seeing the Vatican", New York Daily News, July 19, 1998. "Around the City", New York Daily News, July 19, 1998. "Through Casa Guidi Windows", Antiquarian Book Monthly, July 1998. "Do as the Romans Do", Attaché, June 1998. "On Foot in Literary Lisbon", Antiquarian Book Monthly, June 1998. "Taxi tactics in Athens", there, Spring 1998. "The Pleasures of Seville", The Australian Way, May 1998. "On Location: 25 Fascinating Facts, Venice", Hemispheres, April 1998. "Bagpipes: Popular the World Over", Golden Falcon, April 1998. "The Veneto: what a spectacle! ", Passport, April 1998. "Through Casa Guidi Windows", Biblio, April 1998. "Copenhagen: out of Denmark", Passport, March 1998. "All Aboard the Orient Express", Golden Falcon, March 1998. "At the Home of a Great Dane", Antiquarian Book Monthly, February 1998. "Florence: a scent of one's own", Passport, February 1998. "Italy's Library of Parliament in Galileo's Courtroom", Antiquarian Book Monthly, January 1998. "The Pizza Connection", Golden Falcon, December 1997. "Enduring Stronghold: Prague's Strahov Monastery and Library", Biblio, December 1997. "Prague's Strahov Monastery and Library: Eastern Europe's Oldest Cultural Center", Antiquarian Book Monthly, November 1997. "Goya washed dishes here", The Australian Way, November 1997. "Bridges Past and Present: Links Before Internet", Golden Falcon, November 1997. "Rome: living in the pasta", Passport, October 1997. "Laid back, low down", The Australian Way, September 1997. "Helsinki University Library: Reborn from its Own Ashes", Antiquarian Book Monthly, August/September 1997. "Move over Thomas the Tank Engine", The Australian Way, August 1997. "Phoenix Rising! : The Rebirth of Finland's National Library", Biblio, July 1997. "Gondola: A Crooked Boat Built to Go Straight", Golden Falcon, June 1997. "The Big Breakfast", The Australian Way, June 1997. "Humanism and the Fathers of the Church", Antiquarian Book Monthly, June 1997. "Your Very Own Perfume" Golden Falcon, May 1997. "The Magic of Venice", The Australian Way, April 1997. "The fragrance makers", The Australian Way, March 1997. "Morgan Library Masterpieces on Tour", Golden Falcon, February 1997. "Prepare to lose your heart", The Australian Way, February 1997. "A pizza history", The Australian Way, January 1997. "Islamic Art: As Vast and Varied as the Empire Itself", Golden Falcon, January 1997. "A Look at the Classics", Antiquarian Book Monthly, December 1996. "St. Deiniol's Library: A Place to Book Into", Antiquarian Book Monthly, December 1996. "to a tea: Rome", The Australian Way, October 1996. "Amsterdam: Venice of the North", Bahrain Gateway, September/October 1996. "Fashion Café: Supermodel Foursome Step off the Runway and into the Kitchen", Golden Falcon, June 1996. "The Temple of Peace", The Australian Way, May 1996. "St. Deiniol's Library: A Uniquely British Experience", Golden Falcon, May 1996. "Snips: When in Rome", The Australian Way, April 1996. "Casa Guidi: The Brownings Home in Florence Welcome Guests", Golden Falcon, March 1996. "Britain's Library Hotel", Transitions Abroad, January/February 1996. "Lots of really good books", Our Sunday Visitor, September 10, 1995. "Central Park: New York's Year-Round Backyard", Golden Falcon, June 1995. "American Libraries in Rome", Wilson Library Bulletin, February 1995. "Rome with Brio", Sky, February 1995. "Dining Among the Ruins in Rome", Golden Falcon, October 1994. "New York City: The Art Museum Capital of the World", Golden Falcon, July 1994. "Good News, filled with fire and light", Our Sunday Visitor, June 26, 1994. "Blooming in the Bronx: The New York Botanical Garden Library", Wilson Library Bulletin, June 1994. "Life in the Berg Collection: A New York Story", Wilson Library Bulletin, April 1994. "How to do the Holy City on a shoestring", Our Sunday Visitor, March 20, 1994. "The Keats/Shelley Memorial: Housing the Romantics", Wilson Library Bulletin, October 1993. "Rome Reborn", Messenger of St. Anthony, September 1993. "Artist's Corner: Franco Zeffirelli", Europe, April 1993. "Insider's Guide to the Vatican", Europe, April 1993. "The Food of Ancient Rome", Transitions Abroad, March/April 1993. "Library of Congress opens exhibit of treasures from Vatican Library", The Catholic Review, January 6, 1993. "'Rome Reborn': An Exhibit of Treasures from the Vatican Library", Catholic Twin Circle, January 3, 1993. "'Rome Reborn': The Politics of Culture", Wilson Library Bulletin, December 1992. "The Museum of Radio and Television", Wilson Library Bulletin, November 1992. "Tribute to composer divas", The European, November 26-29, 1992. "Talking with Poet Laureate Consultant: Mona Van Duyn", Wilson Library Bulletin, October 1992. "The Impact of Exploration", Wilson Library Bulletin, September 1992. "Enjoying a feast with the gourmets of ancient Rome", The European, August 20-23, 1992 . "Romantic roamings around Rome", The European, August 6-9, 1992. "Time and Victorian Prudery Fail to Declaw a Rascally Master Cat", The New York Observer, July 27-August 3, 1992. "An Interview with Leo Lionni", Wilson Library Bulletin, June 1992. "Bookmobiles: A Finnish Success Story", Wilson Library Bulletin, May 1992. "Throwing light on Lorenzo's passion", The European, May 15-21, 1992. "Party politician with a talent for poetry", The European, April 16-23, 1992. "Keeping Latin Alive and Up-to-Date in Vatican City, Wilson Library Bulletin, March 1992. "A rebel comes up to scratch", The European, February 20-26, 1992. "I'm just crazy about Leonardo da Vinci...", The European, February 13-19, 1992. "The pope and the page 3 puella", The European, February 7-13, 1992. "Rerum Novarum and the Working Class", Messenger of St. Anthony, February 1992. "Taking small note of women's worth", The European, January 24-30, 1992. "Vatican tribute to the poor man's pope", The European, January 17-23, 1992. "Francis Steegmuller: A Life of Letters", Wilson Library Bulletin, January 1992. "Italy's Great Libraries: An Incomparable Heritage Threatened by Apathy", Wilson Library Bulletin, December 1991. "Enrico Marinelli: La carta diventa preziosa", Il Mondo, 25 novembre/2 dicembre, 1991. "Karen Blixen's Home Now a Museum", Wilson Library Bulletin, November 1991. "The Knight of God", Messenger of St. Anthony, July/August 1991. "Chagall's marriage à la mode", The European, April 19-21, 1991. "An eye on the world from four simple rooms", The European, April 12-14, 1991. "Vatican Library Celebrates St. Ignatius", Wilson Library Bulletin, April 1991. "Holy Week in the holiest city-state", The European, March 22-24, 1991. "City Diary: Vatican City", Diversion, March 1991. "Helsinki Offers a Shopper's Paradise", Travel Agent Magazine, January 28, 1991. "Caroline Feller Bauer: The Pied Piper of Children's Books", Wilson Library Bulletin, January 1991. "Foreign Cultural Institutes in Rome", Wilson Library Bulletin, December 1990. "Shirley Hazzard: Back to Basics", Wilson Library Bulletin, November 1990. "Operation Transparency", Wilson Library Bulletin, October 1990. "Gallimards Kiss and Make up", Wilson Library Bulletin, September 1990. "Publishing in Europe: Recent Reports", Wilson Library Bulletin, June 1990. "William Weaver: The Making of a Literary Translator", Wilson Library Bulletin, May 1990. "The Public Libraries of Finland", Wilson Library Bulletin, April 1990. "What to Expect from U.S. Consulates ", Transitions Abroad, March/April 1990. "Italy's Library of Parliament in Galileo's Courtroom", Wilson Library Bulletin, March 1990. "In the Land of Dionysus, Varied Foods Reflect Traditional Influences", Travel Agent Magazine, February 19, 1990. "Tracking Down the Public Libraries of Rome", Wilson Library Bulletin, February 1990. "Helsinki University Library: Reborn from Its Own Ashes", Wilson Library Bulletin, January 1990. "Exhibit Features Writers on Love and Death", Wilson Library Bulletin, November 1989. "Shopper's World: Helsinki", Diversion, November 1989. "The Best of Helsinki's Designs", International Living, September, 1989. "How U.S. Consulates Can Help Americans Abroad", The Baltimore Sun, July 30, 1989. "What Can a Consulate Do for You? ", International Living, July 1989. "Athens' Distinct Marketplace Offers Clients Variety and Value", Travel Agent Magazine, June 19, 1989. "Convention Takes Stand Against Parental Child Abduction", International Living, June 1989. "The Hard Life of Santa Claus", Eurochic, June 1989. "Holy Hotels on the Tiber", Transitions Abroad, May/June 1989. "Recommended Reading for Overseas Americans", International Living, May 1989. "Eating Kosher in Rome", Transitions Abroad, May/June 1989. "Study Italian in Perugia", International Living, April 1989. "Umbria", First Class Confidential, March 1989. "Rome: Get Thee to a Nunnery to Save", The New York Daily News, March 5, 1989. "Italian Mail--Slower than the Pony Express", International Living, February 1989. "People Don't Come Here to Read Best-sellers: The Vatican Library", Wilson Library Bulletin, February 1989. "Don't Breathe the Air in Milan", International Living, January 1989. "Stamping Through the Vatican", International Living, December 1988. "Hotalings--International Reading at Home", International Living, December 1988. "An Inexpensive Neighbor of Venice", International Living, October 1988. "Rome's Leather Artisans Don't Hide Their Workshops", The Baltimore Sun, August 28, 1988. "Athens--the Glory that is Greece--at Bargain Prices", International Living, July 1988. "Italy Invents the Flying Train", International Living, July 1988. "Free Fun in the Eternal City", International Living, July 1988. "Restoring the World's Art Treasures--an International Task", International Living, July 1988. "From Hermes (1861-96) to Fish and Flora (1988)", Stamps, June 1988. "No Pasta for Passover in Rome", International Living, April 1988. "Get Thee to a Nunnery", International Living, April 1988. "Enjoy Rome, Save lire," Travel Today!, April 4, 1988. "Le Relais Jardin, Rome", Travel Today!, February 29, 1988.1988. "Bill Alexander Goes to Bat for the Expat", International Living, February 1988. "Up at the Villa", Wilson Library Bulletin, January 1988. "The World's Newest Philatelic Museum", Gibbons Stamp Monthly, January 1988. "Stamps of the Vatican", Stanley Gibbons Stamp Collectors Diary 1988 . "Olymphilex '87", Gibbons Stamp Monthly, December 1987. "Buon Natale: Christmas Feasts in Romeome", International Living, November 1987. "Rome's Celebrated Creches", International Living, November 1987. "Where to Buy Your Red Underwear", International Living, November 1987. "A Concise History of the Panettone", International Living, November 1987. "So What's New in Vatican City? ", Stamps, November 14, 1987. "Olymphilex '87, Stamps, October 17, 1987. "The Vatican Library", Messenger of St. Anthony, October 1987. "Dual Nationals--True Citizens of the World", International Living, September 1987. "When in Rome, Eat Gelato", International Living, August 1987. "Bookreview of Filatelia e Francescanesimo by Padre S. Chiarello", Gibbons Stamp Monthly, August 1987. Translation of Gianni Rodari's "The Day It Rained Hats in Milan", Cricket, August 1987. "Presidential Envoy? No. Ambassador", The Messenger of St. Anthony, July/August 1987. "Book Reviews", American Book Collector, June 1987. "International Living Quiz Contest", International Living, June 1987. "Great Goofs-Foreign-Language Funnies", International Living, June 1987. "Vatican City State Stamps", Messenger of St. Anthony, June 1987. "Book Reviews", American Book Collector, May 1987. "God's Mail", Stamps, March 7, 1987. "Quantity Instead of Quality? : Italy's 1986 Issues", Gibbons Stamp Monthly, February 1987. "Spain Honors Borges", American Book Collector, January 1987. "The Slavonic Connection", American Book Collector, May 1986. "Parte oggi l'annata filatelica", Reporter, il 25 gennaio 1986. "Themes at Italia '85", Topical Time, Johnstown Pa., January/February 1986. "Italia '85", Gibbons Stamp Monthly, January 1986. "How Knowledgeable an Expat Are You? ", The International American, October 1985. "Indonesian Forestry Through Dutch Sources", Unasylva, No. 141, FAO, Rome. "Twenty-seven Caribbean Nations Forge Environmental Protection Agreement", Unasylva, No. 142, FAO, Rome, 1983.